Did you catch our latest holiday shopping roundup, 10 Must-Haves for PCT Hikers? 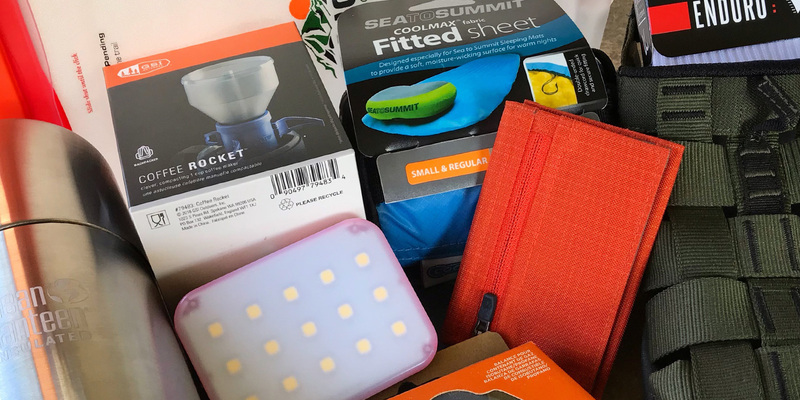 Well now we’re gonna make one lucky hiker’s holiday season even better, because we’re giving away a prize package with a bunch of these great gear items, including stuff from Montbell, GSI Outdoors, Sea to Summit, Gear Aid and more! Just click on the contest panel below to enter. You can score up to five (5) entries per person. The more you enter, the better your chances to win! Get your entries in before December 5, 2o18. We’ll announce our winner on Monday, December 10. Good luck! OFFICIAL RULES: No purchase necessary to enter to win. A purchase does not improve your chances of winning. Up to five (5) entry points per person. Duplicate entries will be voided. Neither PCT: Oregon, Gleam or participating brands are responsible for lost or incorrect contest entries. Void where prohibited by law. | One (1) winner will be chosen at random to receive one (1) Holiday Must-Haves prize package containing gear items from Balega, Gear Aid, JetBoil, Oboz, Montbell, Cnoc Outdoors, Sea-to-Summit, Klean Kanteen, GSI Outdoors. Total prize value: $290. | Deadline to enter is December 5, 2018, 11:59pm PST. This giveaway is open to U.S. residents only. Entrants must be 18 years or older and have a valid email and shipping address. Winner will have 48 hours to respond with a valid email and shipping address or a new winner will be selected at random. Prizes cannot be transferred, redeemed for cash or substituted. Prize will be fulfilled by PCT: Oregon no later than December 31, 2018. Oboz prize item will be fulfilled separately by Pale Morning Media; winner must provide sizing preference. | Facebook Disclaimer: Entrants should understand that they are providing their information to the Sponsor (PCT: Oregon) and not to Facebook. This promotion is in no way sponsored, endorsed or administered by, or associated with Facebook. I saw a presentation by Eli last year. He gave me the courage (and guide book) to do a section hike of the PCT last summer. I would love to take these goodies on my next section. As much as I would love to win…it should go to a fire victim. I agree with Krisf the Gear Giveaway should go to the fire victim. My favorite piece of trail gear right now is my Nathan hydration pack. The coffee rocket and LED lamp are the most attractive items to me. Specifically for the PCT? Probably not. But for all the car camping leading up to that? Hell yeah! Wow! A great collection of gear! Love that coffee rocket. I LOVE my campster sandles this summer. I don’t think I could go backpacking in warmer weather without them! My fav piece of gear is a brand new product called a Kula cloth. It’s an over-engineered and absolutely perfect pee cloth for women! Looks a nice collection of goods. My favorite piece of trail gear is my injinji toe socks. Everything’s better when you don’t have blisters! Favorite gear is ugl air mattress. Keeps me warm and is ultra light! I have enjoyed the instagram follow! Happy hiking, all. All of this gear looks awesome, but I’m super excited about the Sea to Summit Cool Max pad. Completed my last section hike of the Oregon PCT this year – OR and WA completed now!. Love the info. on this site. Thanks for introducing me to Balega socks and SAXX! My favorite piece of trail gear are my Black Diamond trekking poles no doubt! They have saved my knees and back from many days of abuse. I love my Leatherman multi-tool.